Conflict in workplace is a common issue. When you have to interact with your staff and co-workers regularly some problem will arise due to personal in-differences. But here conflict doesn’t mean violence and cruelty, but it is a kind of cold war where clashes are silently occurred and it leads to an argument. But to keep working in the company you’ll need to sort out personal issues and build better relationships with your co-workers. Conflicts in workplace occur due to certain problems like disrespect in the workplace, rumors, verbal abuses, avoiding certain employees, taking one’s side and many more. Here are a few conflict strategies that will help you on how to defuse conflict at work place before it runs out of hand. The following mentioned are few tips on solving interpersonal conflict in the workplace and conflict handling at work. Face and address the situation or issue directly to sort it out within a short time. Convince your other employees to address it. This helps the negative feelings get handled in a proper way and turn them productive. Do not twist the matter by asking questions indirectly or something that you already know. Deal with the matter frankly, this brings a positive intuition about you and helps build a stronger relationship. Bring both the parties together in some event or function. Let them speak on the issue one by one that will help resolving conflict. This step often obtains the fact what the other party is ignorant of. Let both parties talk on the matter clearly without any further argument. This will clarify their misunderstandings which will lead to a patch up. Listen to both the opponents carefully. Listen carefully when the other person complains and criticizes but don’t start judging based on that. Simply listen attentively to show that you’re really concerned about the problem and the company. This process is called ‘active listening’. Listening carefully is a skill which is required to solve a particular issue and is one of the most essential factors to survive in an organization. Bring both the parties to a common ground where they can come to an agreement. This will let you form a bridge and fill the gap which is separating both the parties. Arguing without understanding the main reason is just foolishness which won’t bring any solution. So try to understand it then come to a common opinion that is in favor of both the parties. Respect what the opponents say and appreciate their opinions. Don’t dismiss their words and show your respect to them. Show interest to their words and ideas to assure that you will solve the issue. This step conveys a positive message and shows that you are willing for an agreement and don’t want to carry on with the situation. After listening carefully to both of them, express your own views on the matter. Put an opinion which can lead to an agreement and bring a positive conclusion. Your opinion should be in favor of both the parties so that they don’t realize that you’re supporting the other person. So put your views smartly. After expressing your own viewpoints, take help from your co-workers and seek for their advice. It is important to ask help to your coworkers. The advice of the majority is important since it is more convincing and can change the opinion of the opponents. Encourage both the parties to come for an agreement. This is one of the most important steps since it makes you support both sides and assure them that you’d fix the problem without any partial conclusion. Supporting both sides indicates that you will solve the issue without making things worse. Conflicts generally give rise to negative thoughts and feelings which are tough to avoid. These feeling will remain for sometime after the problem is solved, so learn to control them and convince yourself that everything is ok between both of you. This is the toughest stage since negativity remains for long unless you avoid thinking of it. More argument will lead to a worse situation, so remain calm and talk on the matter. Don’t be judgmental and irritate the employee with additional arguments and aggressiveness. This can fuel the fire and lead to a nastiest stage. Support both parties objectively and learn the root causes of conflict in the workplace to understand better. Approach with your statement professionally, without being too emotional and attacking the opponent directly. Express how you feel about the situation, rather personally attacking the other person. Apply your communication skills to talk objectively. Do not criticize or start blaming each other, rather take the responsibility to educate how the words and statements affect the others. If the person thinks that you abused him then don’t react furiously, rather come to a solution. This help you act on a professional level and reflects your urge to solve the matter without any more quarrel. Do not blame the person because he/she might get out of the conversation disappointed. It is important to fix the problem rather than blaming the other person. Focus on the problem and not the person; this will help you solve the issue rather making relations worse. Whatever might be the reason of the conflict, you should focus on the future rather than thinking of the past. That will ignite your anger even more and lead to a worst situation. People often look at the past to find out what went wrong so that they can fix their future and improve it. The secret of recovering a relation is to focus on things that went wrong and work for its development. This is something exactly like what salespersons do. They offer a choice to their customers, either they can pay for a product monthly or yearly. Similarly, it’s like saying that either you can do this or do that, whichever is better for the opponents. This is called sales skills, i.e. offering two positive choices to a person that also shows that you are trying to help them out. Since the current conflict blew the trumpet in your workplace, you can prevent it from occurring again. Talk about it in your office meetings and urge them for organizing conflict management training. Openly state your views to employees and other staff members and convince that conflicts are against our culture and tradition. Seek advices from other employees that would benefit the company and admit any error when you commit it. Too much gossips and controversy can lead to more conflicts. Where a number of different minded people work, controversies are likely to occur at that place. Too much personal gossiping about others, fuels the anger in that person whom you are gossiping around. So, high amount of gossiping should be reduced in order to maintain peace and harmony in the workplace. Using slangs and vague words are more likely to heighten the conflict. This strikes the persons sentiment and it possibly upsets him. Using vague language also ruins your professional status and your position in the company. Your staff might not respect you the way like they used to do earlier. So prevent using such languages to maintain your status and remain consistent with it. Coaching the employees on conflict management can really prevent further conflicts in a company. 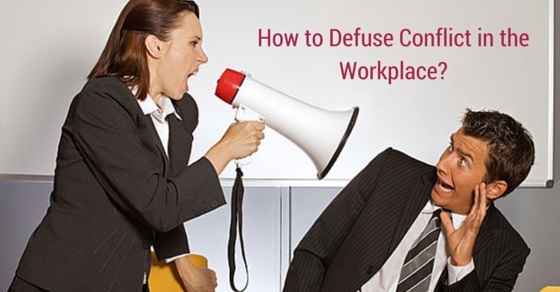 Managing conflict in the workplace helps in defuse the situation of work conflict. Train them with the existing conflict examples and develop skills in order to handle the future difficulties. A trained professional is likely to tackle with the issues and result with neutrality whenever you need it the most. If the conflict situation is too serious then you can hold a private meeting to discuss the sensitive information. You can clarify the issues and state them specifically. Apologize for argument and for the inconvenience caused to the rest of the staff. Find out the positive aspects for working out with a good relationship. Think out of the box and seek for a solution. Brainstorming takes extended time to find the right solution but it really does work. Instead of cash refund, if you offer special discount to customers make your business run for a longer time and show that you are capable of doing the job. Conflicts are usual in work organizations but too much of it ruins the work atmosphere and hamper the company reputation. It depends upon the company employees to tackle it and stop it from being occurring again and again. As much as possible keep calm and talk rationally on the matter. Learn to understand your employees’ point of view and on what basis he puts that opinion on the issue. Apply your communication skills to act professionally without getting emotional. This will help you in understanding each other better and build a stronger relationship.